Walk farther, faster and healthier… You need trekking poles. We all have our pet peeves. Mine for a long time was nerds roaming my favorite trails with trekking poles. I always thought they were for the old, infirm and dorky. I simply saw no benefit in loading up another piece of gear with only occasional usefulness. I was headed out on a backpacking trip on the Appalachian Trail with some college friends for four days and decided to give poles a try. I came back from that trip a trekking pole convert. I found them useful in more ways than I imagined and found they were an absolute help in preventing fatigue, increasing endurance and decreasing the chance of injury. 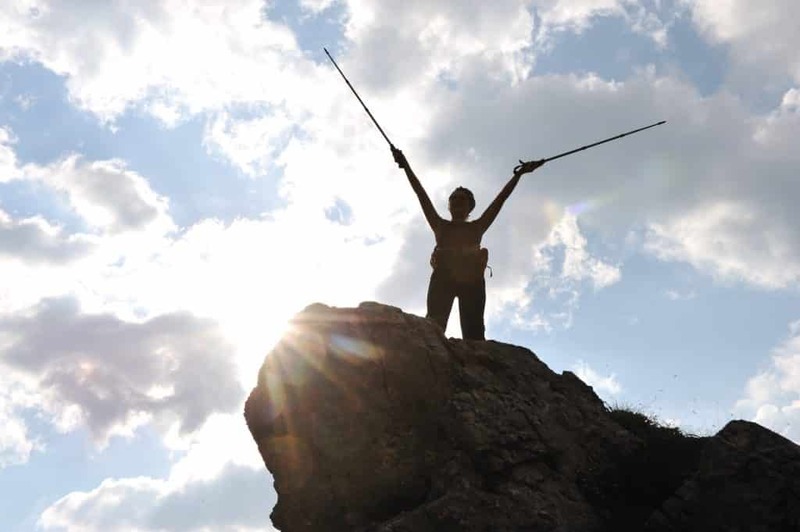 I will spend a few paragraphs outlining the benefits and drawbacks of trekking poles. I will then explain the different types of poles and how to work a pair into your outdoor gear budget. Trekking poles distribute the work of climbing and descending over your whole body. Your hands, arms, chest shoulders and back contribute to your forward motion, meaning your legs have a reduced workload. Medical studies have shown that hiking poles will help save your knees and result in less stress on your joints. You can hike longer with less joint stress. Trekking Poles help you maintain a more even pace and make you more stable. They provide a third and fourth point of contact when negotiating obstacles. Poles serve as tool for making improvised shelters (as a pole) and can be used to clear small obstacles and ward off small animals. You use more energy over a give amount of time (though you will travel further during that time). They can break or malfunction – then becoming just more gear to carry. They take time to learn to use effectively. This is not a buying guide, so we will be brief. The biggest distinction in poles is fixed length or adjustable, which is self explanatory. I would never recommend a fixed length pole for anyone. Adjustable poles come in telescoping or folding (AKA Z Fold). Telescoping poles are stronger and usually fold down to 2 feet, where ZFold poles fold down to about 15 to 18 inches. Generally you will pay more for quality, ultra lightweight and for a known brand name. You will find the right pole in your budget. 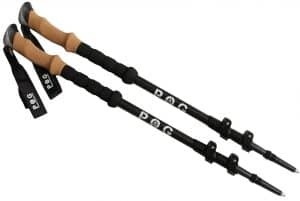 Affordable and Packable: POG Kephart Z Fold Trekking Poles, regularly $79.95, on sale now for $54.95. These poles have features of big brands costing a full $100 more. 100% 3K carbon fiber, natural cork handles, padded wrist straps and accessories included free. The poles weigh about a pound, adjust from 45 inches to 53 inches making them great for users 5’6” to 6’5”. They also fold down to 15 inches long for easy storage. 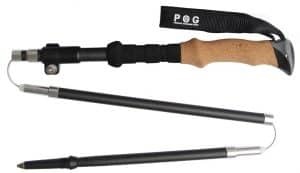 Ultimately Adjustable: POG Kephart Z Fold Trekking Poles, regularly $99.95, on sale now for $57.95. These three section telescoping poles have all the features of the POG Kephart, only they are fully adjustable making them great for all users. The Katahdin model are only 24 inches long when stowed, but can be adjusted from 24 inches to 53 inches, making them perfect for anyone from 4’ 6” to 6’5”. These poles come with all the accessories you will need including snow and mud baskets, rubber tips and a carrying bag. They also weigh in at less than pound for the pair! Thes poles use LEKI’s Dynamic Suspension System to reduce pole shock and vibration. This pole is adjustable from 45 to 53 inches and folds down to 15.5 inches. Super lightweight and using Leki’s SpeedLock 2 system, this is the ultimate pole for the money. There are many more poles to choose from. Remember that you will want above all a pole that adjusts to your needs. I find that I always begin with the same setting where i bend my elbows to 90 degrees and then lock the pole to that height. I then will adjust that height based on terrain and what feels good as the day progresses. Generally, a fully adjustable pole will work well for anyone. From there your budget and preferences will drive your decisions. You can certainly find the right pole at the right price with just a little work.